WWJ-TV began their first day of commercial programming on June 3, 1947. A short time later, one of Detroit’s earliest children’s shows cast its phosphorescent glow into thousands of Detroit living rooms. 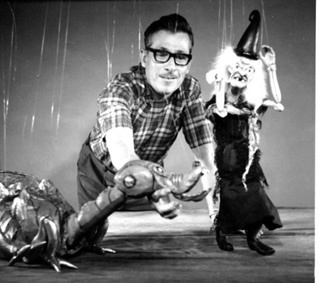 Let’s See Willy Dooit was an imaginative marionette show created by master puppeteer Ed Johnson. For 44 years Johnson practiced his craft on over 600 TV programs and performed more than 15,000 stage presentations at area schools, libraries and functions, always teaching lessons through his marionettes. Edward Stone Johnson was born in Almont, Michigan on June 27, 1918. Soon after Ed’s birth, the Johnson family moved to nearby Highland Park. At the age of ten, young Ed was given a set of marionettes for Christmas. Johnson became fascinated with his new stringed companions, and before long was performing marionette shows for his family and friends. Looking to learn more about his newly found hobby, Johnson discovered Highland Park’s famed Artisan Guild, where master puppeteer Paul McPharlin resided. 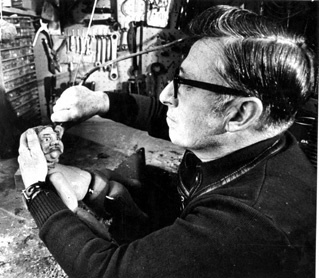 McPharlin, regarded as the preeminent authority on the subject of marionettes, was so impressed with Johnson’s youthful enthusiasm that he hired him on the spot to work part-time in his studio. 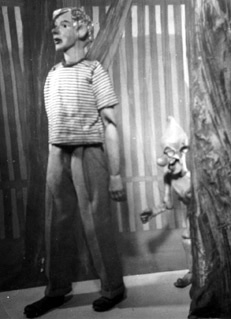 In 1936 Johnson assisted McPharlin in organizing the first National Puppetry Conference at the Detroit Institute of Arts, where he exchanged information with the top puppet performers of the day. Before long the young puppeteer was confident enough to strike out on his own, and on November 1, 1939, Ed Johnson’s Marionettes was born. The enterprising Ed utilized all of his puppetry skills for his new company. 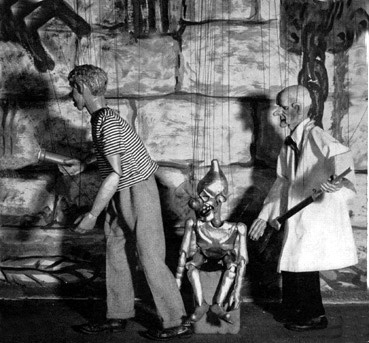 He designed and built his own marionettes, wrote original scripts, created soundtracks, rigged stages, built props and painted his own scenery. During World War II Johnson closed up shop for three years to serve in the United States Army, where he was stationed in the South Pacific. Although experimental television signals in Detroit were broadcast from the Penobscot building as early as 1938, commercial television in the Motor City didn’t become a reality until after the close of World War II. WWJ-TV was the first broadcast facility in Michigan to air regular programming. In those early, pre-coaxial cable days, the fledgling station had to generate 118 hours of live, in-house programming every week. Always on the lookout for new ideas and talented people, WWJ hired Ed Johnson to produce a daily fifteen- minute marionette show. Let’s See Willy Dooit featured the adventures of Willy, a tousle-haired, curious young boy who owned and operated his own fix-it shop. Willy’s good friend and mentor was Professor Smart. Molly Cuddles, Willy’s girlfriend, was the daughter of the distinguished Senator Cuddles. The two most fondly remembered characters though would have to be Gee-Whizzer and Applesauce the Dragon. Gee Whizzer, an odd-looking gold skinned gnome, was constantly scheming to get Willy into trouble. Applesauce the Dragon was the most bizarre looking dragon anyone would ever hope to encounter. With a dog-like head and an insect body, Applesauce accompanied Willy and Gee Whizzer to places near and far for many exciting video adventures. The show was broadcast live every day, with Johnson operating the marionettes as well as supplying voices for the characters. WWJ’s wunderkind weatherman Sonny Eliot and Toby David, CKLW’s Captain Jolly, also supplied some voices. The show’s gentle humor was charming, and Detroit kids ate it up. In the late 1950s Willy Dooit became a feature of Milky’s Movie Party, an association that lasted for six years. 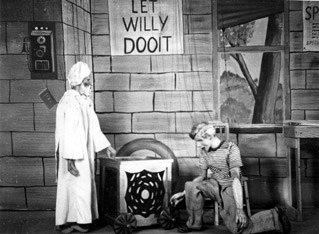 Milky’s show, along with Willy Dooit, was the only local children’s show that aired on all three Detroit stations. When Willy, Applesauce and Gee-Whizzer disappeared from the local airwaves Johnson took his one-man show on the road, visiting hundreds of area schools for thousands of performances. The master puppeteer hung up his marionettes for the last time in 1983, when he retired to Arizona, ending a 44-year tradition of entertaining three generations of Detroit children. Ed Johnson passed away on February 20, 1998. The Johnson Marionettes legacy continues with Ed’s son Greg now pulling the strings for Willy, Applesauce and all of the other well-loved characters. Greg continues the tradition of performing at area schools with his father’s original marionettes. “I get people at just about every show tell me that they remember Applesauce when they were a kid. Some are in their 60s or older.” There’s something comforting in the fact that despite today’s CGI enhanced children’s entertainment like Jimmy Neutron and Monsters Inc., today’s children still scream with delight at the stringed antics of Willy Dooit, Gee-Whizzer and Applesauce the Dragon, just as their grandparents did six decades earlier. Introduce your child or grandchild to the wonderful world of Johnson Marionettes. Applesauce the Dragon and Johnson Marionettes have entertained audiences for over 64 years. Book Johnson Marionettes for your next school assembly, church group or activity. Only Johnson Marionettes has the original Detroit TV stars Willy Dooit, Gee-Whizzer and Applesauce the Dragon. Email Johnson Marionettes at wendyluvspie@aol.com, or call 248-669-3854.